Beko mochi is a simple sweet that was common in Hokkaido when I was a child. 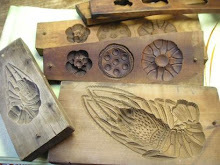 Families would make it at home using small wooden molds that might have been passed down for generations. It consists of little more than a steamed dough of two kinds of rice flour sweetened with sugar (white sugar for the white dough; dark brown sugar for the brown dough). It contains no an, and no flavoring other than the sugar. The Hokkaido version of beko mochi is almost always shaped like a leaf-- part white and part brown. 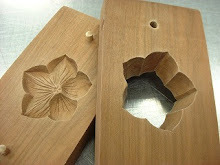 City folk sometimes purchase them from wagashi shops-- more for their nostalgia value than for the flavor or appearance. But in the countryside, grandmas still follow the multi-step procedure of kneading two kinds of rice flour (glutinous and non-glutinous), steaming the dough, kneading again, pressing it into molds, and steaming it again.